The patient is a 47 y.o.female who presented complaining of blisters and ulcerations on her lips. 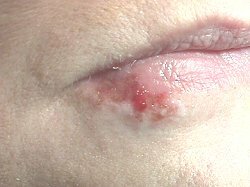 The patient reported a burning sensation of her lips prior to development of the lesions. Medical history revealed the patient to be taking Valium and that the patient was under stress at work. Examination of the upper and lower lip revealed crusted coalesced gray vesicles with ulceration of the lip. Mild edema of the lower lip was present.